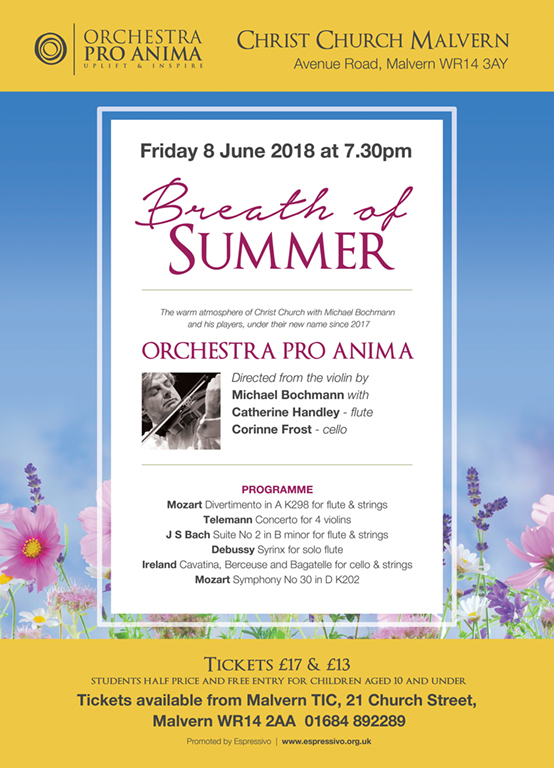 ORCHESTRA PRO ANIMA RETURN ON FRIDAY 8TH JUNE 7.30 P.M.
Christ Church are also thrilled to see Michael Bochmann MBE and his Orchestra return for what promises to be a wonderful summer evening of beautiful music and there will be wine, soft drinks and canapés available from our “Christ Church Bar” during the interval to add to your enjoyment! We all look forward to welcoming you. We are thrilled that Catherine Handley is joining us for this concert and the famous Bach Suite. She has a very special flute tone which is a real experience. We are playing two wonderful pieces by Mozart that are perhaps not quite so often performed and are an exciting discovery. The symphony no 30 is fresh and delightful as you might expect from a young man and the Divertimento is possible because we have the flute so a rare opportunity. Corinne Frost performs three really delightful pieces by John Ireland. 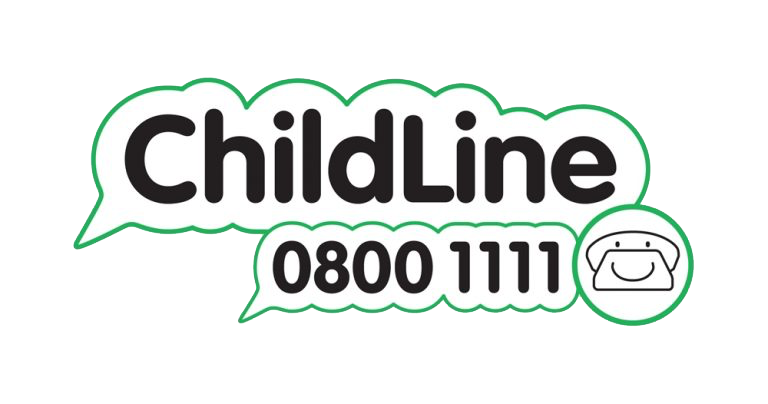 Welcome to the ever warm and welcoming atmosphere of Christ Church. And please do take note of the time of 7.30 pm. The next event in this popular series of Orchestra Pro Anima concerts at Christ Church will again feature a mixed programme of music from the Baroque, Classical and Romantic periods. This time, the orchestra is delighted to welcome the acclaimed flautist Catherine Handley. 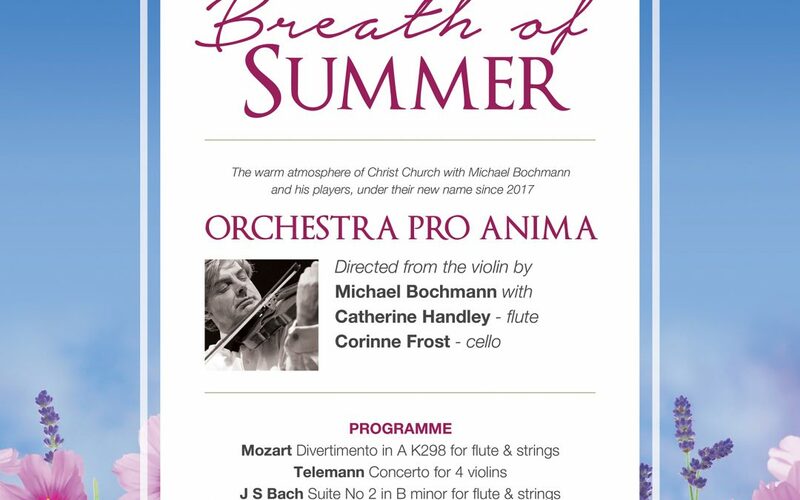 Orchestra Pro Anima, with its director Michael Bochmann, was launched in January 2017 and is formed of musicians who have played together over a long period as members of the English String Orchestra and who have a real affinity with one another, forged over time. Their programmes, musicianship and warmth of presentation are proving to be a winning combination. 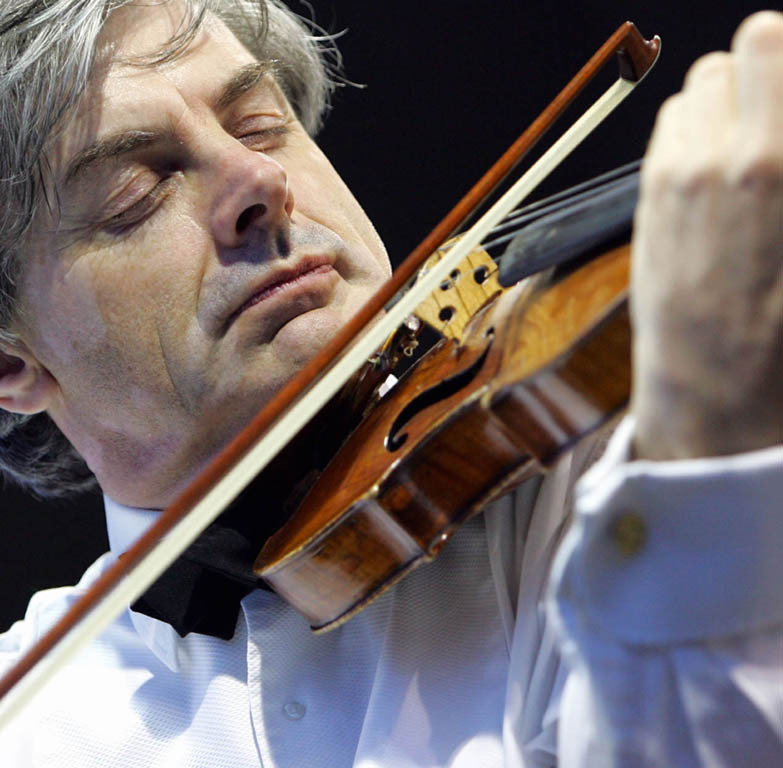 This is a special venue for the orchestra as the Church has a most welcoming and relaxed atmosphere, allowing for spontaneity and a feeling of oneness with the audience, which are hallmarks of Orchestra Pro Anima concerts.